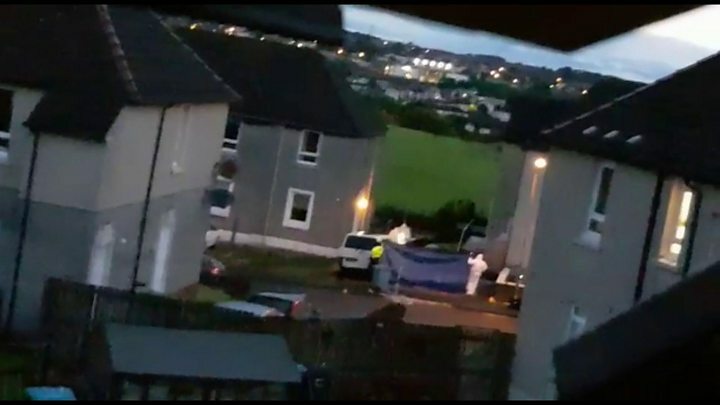 Up to 10 shots were fired at a man who was killed in a drive-by shooting in North Lanarkshire. BBC Scotland understands that the suspects fled the scene in a white Skoda, which was later found burnt out in the north of Glasgow. 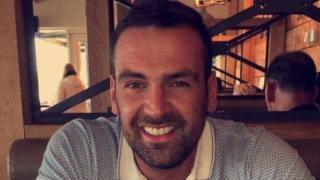 Father-of-two Mr More, who was known to police, was pronounced dead at the scene. He was with another man, who escaped unharmed, when he was targeted outside his rented flat in Gartness Drive. Detectives believe up to four men were in the Skoda but only one, who was a rear passenger, fired the fatal shots from a handgun. The car was found ablaze two hours later, more than 20 miles away, on Craigmaddie Road. One early theory is that the murder may be linked to a local dispute. Det Supt Jim Smith, of the major investigation team, said: "The victim was outside his house in Gartness Drive when a number of shots were fired at him causing fatal injuries. "Although the investigation is at an early stage, it is not believed to be a random attack and at this stage we believe the victim has been targeted by the person responsible. "I am appealing for anyone who was in the area of the shooting or the area of the burnt-out vehicle, who may have witnessed a small, white car or anyone acting suspiciously to get in touch with Police Scotland as a matter of urgency." He said officers were carrying out door-to-door inquiries and examining CCTV footage in a bid to map the movements of the car. Supt Louise Skelton said: "We are aware the local community will be shocked by this incident as it took place in a busy residential area early in the evening. "This is being treated as a targeted attack, and we have taken immediate steps by increasing police patrols in the area to provide public reassurance." Mr More's friend, Keir Agnew, laid flowers near the police cordon. He said: "It is upsetting for everybody. It is shocking. "Gary really would have done anything for anybody." He said Mr More, who is originally from Holytown, North Lanarkshire, ran a gym and taught self-defence classes. Mr Agnew added: "I always remember Gary as a wee daft boy that grew into a big daft guy. "He was always the same. Every time I would see him we would have a mad laugh. "I can hear his laugh now. It was infectious. "The guy was always happy. "It is just unbelievable what has happened." Airdrie South SNP councillor Michael Coyle described his shock at hearing the news. "It is a wee village and it does not have any trouble at all," he said. "Something like this makes people start to worry."